Would you SEARCH the first floor bedroom? Do we need a High Pressure Fan or just some timed tested Ventilation Tactics? What do you think/ Take the time to read post below and give your comments. The Title is that; Ventilation. 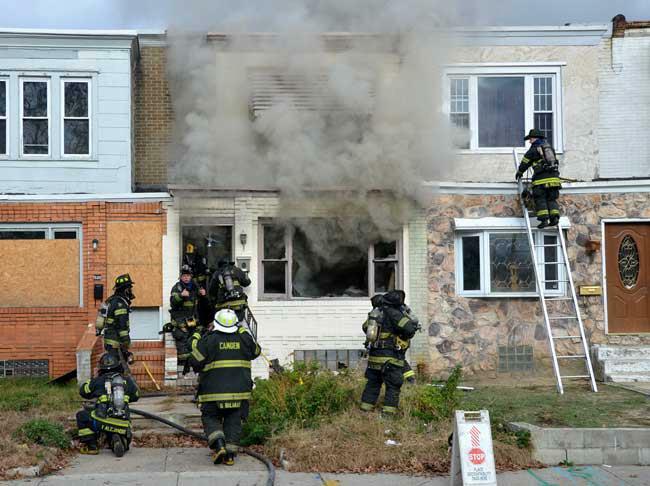 To effectively attack a fire requires multiple tactics performed by trained firefighters. Extinguishment requires water on the burning solid fuels. To support this so crucial fire ground function, we let the products of combustion out by horizontally or vertically, making use of an existing opening or creating one. Coupled with proper timing, the heated fire gases will rapidly release to the outside. Forcing theses gases out by means of a high pressure can, and will intensify the fire’s growth. If the opening is too small, a back pressure will be created. The fire will be forced back on the advancing attack team. This back pressure can also force fire into other areas of the fire building. If we can get the attack team in rapidly to apply water on the fire; we can then provide positive pressure ventilation to remove residual smoke without the concern of feeding/pushing the fire into unwanted areas of the fire building. The individual assigned to place the fan at whatever entry point should and could be used to assist getting the attack line in place quicker; to possibly eliminate the flashover event. Question when the fan is in place before water has been applied to the burning solid fuels. Why would you provide a working fire with high pressure oxygen? Once the fire has been knocked down, you can then consider positive pressure ventilation to remove the residual smoke. The fan should only be placed into service when it has been confirmed the attack line is still manned for any possible flare ups or hidden fire that will show itself. The fan should also be manned with a firefighter monitoring the attack channel for orders to shut off the fan. Remember that hot dry smoke naturally wants to take the path of least resistance to the open atmosphere. There really is not a need to force it out before water has been applied. 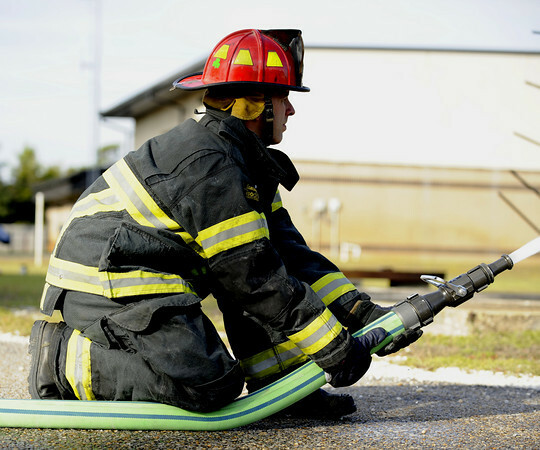 If ventilation is required to make the push; utilize decades of proven ventilation tactics. When opening the door for entry of the attack team; consider if this will be the path of least resistance for the fire and the products of combustion that have been created. If so, vent in close proximity to where you believe the majority of fire has occupied the structure before entry. Once the door and/or vent opening has been created you only have a short time to eliminate the enemy. There are no time outs. Study Top Photo and then Bottom. Compare the two and what changes have transpired. 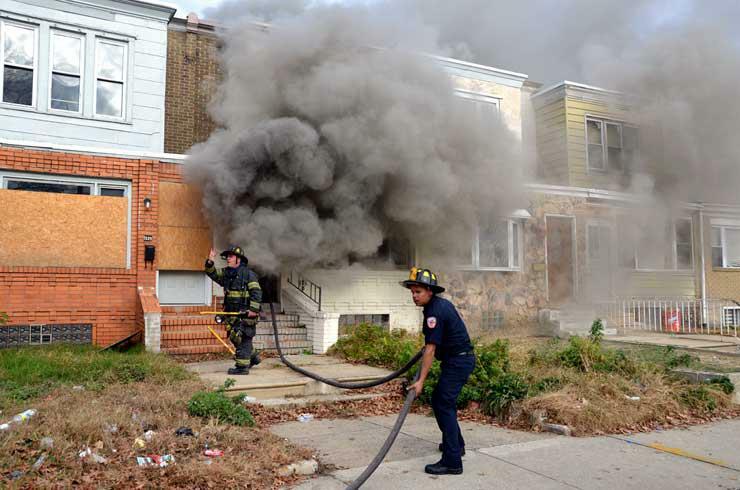 How many Firefighters required to flow a 2.5″ Attack Line? How much does a 50 section of 2.5″ weigh when charged? How much can you flow through your 2.5″? Do you leave the 1″ tip on? 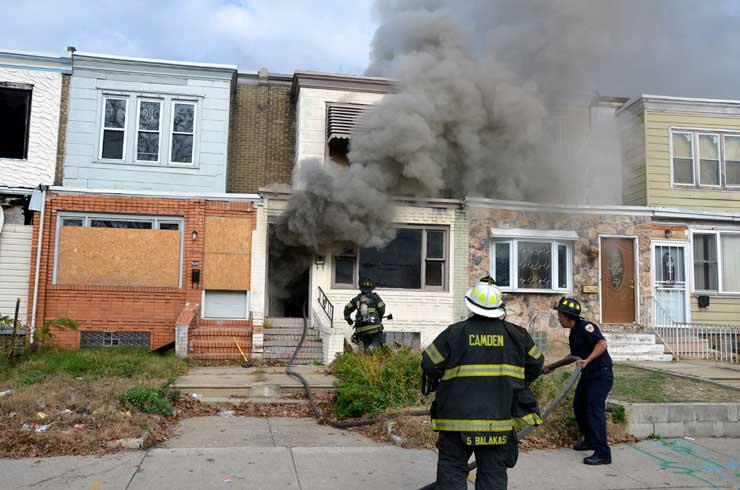 Does your FD deploy 2.5″ on commerical building fires? WHY NOT? 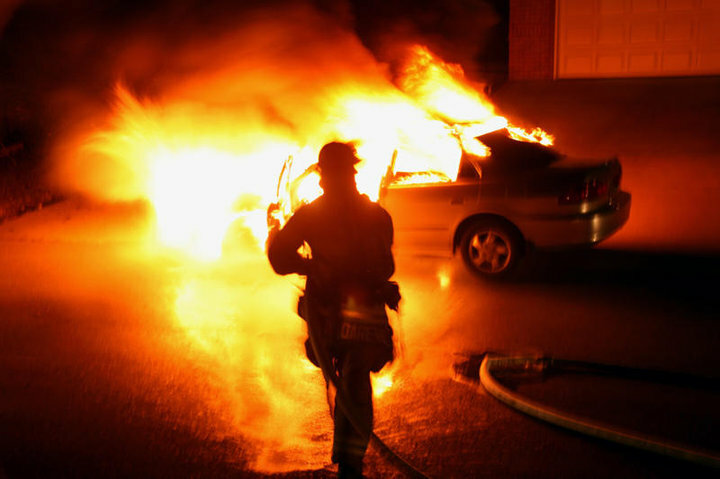 Does your FD use 2.5″ on fully involved garage fires? Why is this method above more effective than the coil?